us who enjoy the game of golf. We too… would love to live where one could practice shots in one’s pajamas before breakfast. 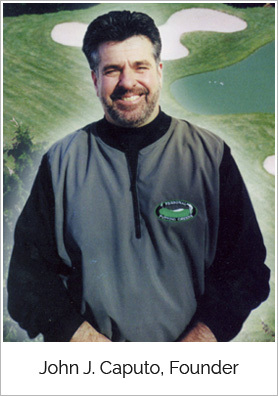 John J. Caputo Jr., founder of Personal Putting Greens located on Long Island, NY is proud to introduce a company that can truly “Turn Your Dreams To Greens.” Since their first project in 1990 Personal Putting Greens has constructed more than 400 putting greens at some of the finest homes and residential complexes imaginable. 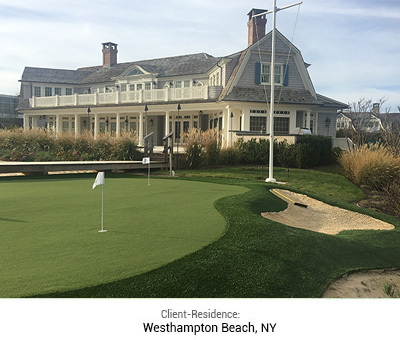 This unique approach has made Personal Putting Greens the most sought after designer and builder of residential and commercial putting greens on the East Coast. We design and create realistic putting greens with contours and interesting cup locations while allowing enough area for challenging putts and accurate chips. This is important to every putting green. But we don’t stop there. Now Imagine adding a wave of white sand, several shaped mounds at the collar of the putting green or even a water hazard to chip over. Art and utility meet. As George Thomas, the golf course architect of Bel-Air CC and Riveria CC, said, Both are absolutely vital. We invite you to browse through our portfolio of projects. Some are small putting greens, others are par 3 golf holes. They were all designed and built by Personal Putting Greens in concert with our clients needs and their budget.